This post is LONG overdue. As an Irish gal who’s a massive foodie and health fanatic, I sort of can’t believe I haven’t written my Dublin food guide yet. But FEAR NOT. Here it is, all glittering and shiny, ready for you! I’ve lived in Dublin since I was five. I’ve been a foodie for perhaps equally as long (apparently even as a baba I was a sweet potato mash fan…ask my mom! ), and particularly so in the past maybe 6 to 7 years. Writing food guides to cities is something I’ve wanted to start adding to my blog for ages – but as always, time is the limiting factor! BUT. With a glorious week off recently after a week of seven night shifts, I thought, what better chance to finally write it? So here we go! Grab a coffee, it’s a good read, promise! c) I think when you travel to a new city, those are the kind of places you want to have recommended to you, so you don’t have to spend ages Googling on the go! I hope you enjoy visiting these spots as much as me! And if you do ever want any recommendations for dinner spots in Dublin city, or would like me to do a foodie guide just for that, let me know! I love Kaph for two reasons. First of all, it does incredible coffee. A must to make it onto the list! And second, it has the cutest upstairs section which, while small, is such a peaceful place to take your brew, either with a friend, a good book or your laptop, and while away the hours. The staff are so friendly and chatty – and it opens on Sundays! I found this place when I attended the Linwoods Hemp Protein launch, and happily for me, I had decided to arrive early that day and try the coffee first. It blew me away. I’m not exaggerating. They roast their own coffee right there in Dublin, and have a fantastic coffee and lunch/brunch menu. I have yet to try the food there, but trust me, it is HIGHLY rated and equally high on my foodie to-do list. See this van? This is the Cocobrew van, and for me it’s always reminds me of good frickin’ vibes. I first met the Cocobrew crew at my first Wellfest, when I tried their famous ‘Cocobrew’ (freshly brewed Arabica coffee with a tablespoon of MCT oil and cacao butter – it’s a taste experience let me tell you) as a pre-workout boost before the main stage sessions at Wellfest! It worked, that’s all I’ll say! Jokes aside, I’ve been lucky to meet these guys at a few spots around Dublin, and now they have their own cafe in Temple Bar! They recently very kindly sent me some of their delicious coffee range so I could make my own Cocobrew – it was a total success! 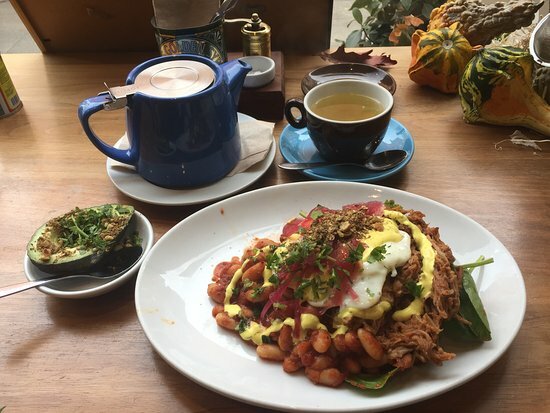 Cocobrew have also recently launched a breakfast and lunch menu which I’m planning to check out this month – keep an eye on my Instagram for that! Overall, good vibes, gorgeous coffee – mark it on your map! Aww, this place. It’s my newest coffee find in Dublin, and I just can’t big it up enough. I was introduced to it by the solid F45 crew (thank you Fearghal Purcell!) and during my first week of F45 classes (I had a week off remember!) I basically went there for coffee everyday…THAT’S how good the brew is. Coffee aside, Laine also do a serious breakfast and lunch menu – number 1 on my foodie ‘to-do’ list is to order their Cashew Butter & Blackberry Sourdough Toastie. Yes, you read that right. I won’t judge if you just drooled (I did). GO GET IT PEOPLE. Fuel is a local spot to me, located very close to the Clontarf seafront, and I absolutely adore it. It’s pretty tiny, consisting of a small kitchen with about 8 or 9 tables, with beautiful coffee and a deliciously simple breakfast and lunch menu. I love taking a long walk down there for breakfast and a brew when I can – the smell alone when you walk in will keep you there! Shoe Lane is another hidden gem and a big favourite of mine, though I definitely don’t get to stop by enough. It’s right beside Tara Street train station along the River Liffey in Dublin, and if you didn’t look twice, you might miss it! So be sure to look three times guys, because it’s a beautiful little stop-in. Friendly staff, tunes going, and coffee you’ll want a second cup of. Yes please. I have a Brother Hubbard obsession. If you try the menu there, I guarantee it, you will too. I even have the cookbook! I’m not sure how to describe how much I love that place. Brother Hubbard has two locations, one on the Northside of Dublin, and one on the South, so thank the LORD for that! The menu there is just absolutely inspired. The owner puts such heart, time and effort into really understanding the background culture of the food they serve – there is a fabulous Middle Eastern style to the menu. My personal favourite? The Turkish Eggs Menemen. Everytime. I finally visited Two Pups with my good friend and fellow blogger Vicky (@theflourishingpantry on Instagram!) late in 2017, and boy, we were NOT disappointed. I had an absolutely incredible Wild Mushrooms with Fried Eggs on a thick slice of sourdough toast – and to totally make my weekend, they were cooking up a seasonal sprouts side dish that weekend, which of COURSE I ordered. Holy Moly. With a cosy interior and friendly faces at the door, it’s a win-win visit you should NOT miss. Bring your appetite. Another BEAUTY that Vicky and I tried very recently, the day before Christmas Eve actually! Tang grew from the Yogism Fro-Yo chain in Dublin, and happily for me, it’s located on Dawson St, very close to where my pops works, and right bang in the centre of south Dublin city. This was another spot where I couldn’t resist ordering a Wild Mushrooms with Poached Eggs on sourdough dish (can you spot my favourites here? ), and Vicky will vouch how totally blissed out I was if you don’t believe me. Tang have a tasty menu, with choices like shakshuka and pancakes to tickle your fancy too! I’ve put Tang on my brunch faves because I was so impressed with it, but you could definitely visit here for a great lunchbox on the go too, as they make up fresh inspiring salads every day! I couldn’t leave out this absolute gem – not after the epic Roasted Mushrooms/Poached Eggs dish I had there earlier this year. My friend and I visited on a busy Saturday morning – which from what I’ve heard is standard for everyday of the week for the Two Boys gang, never mind the weekend rush! 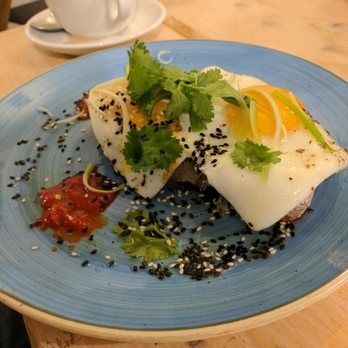 The menu here is really varied – from granola to bircher bowls to eggs and avocado on toast, you’ll never be stuck for something delicious to try. The coffee is also gorgeous, with house and guest roasters featured. It’s a little out of the way of Dublin city centre, but very VERY worth it. I. Adore. Sprout. Another beauty located on Dawson Street, Sprout is relatively new to the Dublin foodie scene, having opened in 2013. It’s known for it’s exciting and creative menu of salad bowls and sandwiches, which changes with the season, using locally soured ingredients. Their juices are also pretty well known too. 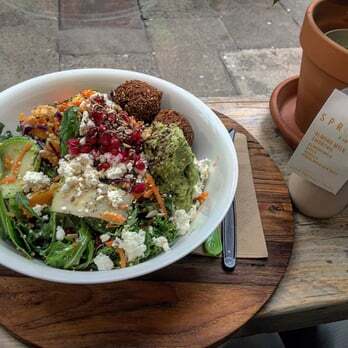 My favourite thing to eat at Sprout is essentially anything from their salad range – if I had to choose, I would choose TWO as my favourites – the Falafel Salad, and the Roasted Turkey Satay Salad. Both may or may not be on the menu right now, but happily for you, they also offer a ‘Build Your Own’ option where you choose your greens, your base (e.g. rice, quinoa, etc), your protein and then additions! I 100% recommend their homemade satay dressing – if I could somehow wangle a lifetime supply…oh man. Happiness. The well travelled cliff walk from Bray to Greystones is an absolute must do in general, but especially for anyone looking for an active day out just outside of Dublin. And that walk isn’t complete unless you finish it by arriving at The Happy Pear cafe in Greystones for your well earned lunch! The Happy Pear is run by twins Stephen and David who are larger than life, full of passion for food, fun and making healthy eating delicious. They have a super couple of cookbooks out too! The menu is totally vegan, but whether you’re a meat eater or vegan it doesn’t matter, you’ll be in foodie heaven whatever you choose. My FAVOURITES there are the Massaman Curry and the raw ‘Twix’ bars – trust me, you’ll be licking the plate. The lads are often there too so keep an eye out for their smiling faces! KC Peaches (KCP as I call it!) is an absolute blast from my college past that is very much a constant part of my present. Poetic or what! KCP is a cute cafe on Nassau Street in South Dublin city centre, which I adore for it’s hot and cold salad bar, where the formula is simple, and perfect especially for students. You choose either a plate or a box, in sizes small, medium or large, and you fill it with your choice from their salad counter. They do a brilliant range of hot dishes each day too, which you can mix and match! It’s good value for the quality of the food you get, it’s reaaally tasty, and a big go-to of mine when I’m in town and need something quick, nourishing and delicious on the go! Those of you familar with the suburbs of North Dublin will probably have heard of Swords, and if so, you might know about Green Straw. If not, aren’t you super lucky I’m telling you about it now! My mom actually takes all the credit for finding Green Straw – she knows my taste well! Anytime I go to visit her for lunch, that’s where we go. They do a great range of salads, which can be from their menu or in ‘build your own’ style, as well as an always creative ‘Salad of the Day’ too! You can try wraps, soups, smoothies and homemade baked treats there too – it’s a great visit every time. Bear Market have a couple of spots around Dublin, and I only got to try their coffee recently, but they are killing it on that scene! Definitely worth stopping in. I have seriously fond memories of Pog – from our first Irish Girl Gains event to a recent Fit Girls event, it’s a brilliant little gem on the north side of Dublin city. Stop in for the famous Protein Pancakes with your choice of toppings – and try to stop yourself licking the plate clean! This spot was where Vicky and I first had a blogger date! We bonded over the creative menu, and tried to get to know each other in between drooling over the brunch! Where are YOUR favourite foodie spots in Dublin? Leave a comment, DM me, let me know! I still have many more to discover, so watch this space! If you visit any of the places I’ve given a shout out to here, I would love to know what you thought! You really need to try Urbanity in Smithfield! Ooh! I’ve never been! What sort of menu – brunch? Thanks a mill for a fantastic post Ciara! I can’t wait to try some of these places and revisit old favs too! Also in Dublin I like Eathos- delicious granola & amazing salads! Not to mention tasty coffee! Industry – lovely scones, salads are out of this world & again great coffee! Fallon & Byrne ship serve delicious granola, fruit & yoghurt! Balfes- have many healthy options on their lunch menu! So many delicious options in Dublin, it’s a foodies paradise!! No worries at all Margaret! I’m so glad you like it! I was in Eathos yesterday for coffee it was fab! Must try the food there too. Love Industry! And Balfes do a great brunch I agree! Thanks so much for your faves!!! Thank you Ciara ! Just can’t wait to come to Dublin and try some of these places. Some people also recommend me The Fumbally and Queen of tarts. Did you try them ?